Figs have been cultivated by man since ancient times (4000 BC) and are well known throughout the world. The unusual fruit grows on a deciduous subtropical tree, native to Western Asia. There are several types of fig, a large number of cultivars (cultivated varieties) of each type are available. Figs have grown successfully in home orchards & backyards since early European settlers first brought them to New Zealand. With an age-old reputation as a sustaining and nourishing food, figs are friendly to the digestive system in either fresh or dried form. This is because they contain an enzyme called ficin that helps the digestive process by soothing your gut. They are also mildly laxative. Dried figs are a rich source of fibre, iron, potassium and calcium, making them a useful food for people with high blood pressure. Weight for weight, a fig contains more fibre than most other fruits or vegetables, so they're great for your bowels and your cholesterol levels. They're also high in polyphenol antioxidants, which can make them a valuable food for cancer prevention. The instant energy they provide and their ability to prevent cramps make them ideal for athletes, too. Eaten raw, whole, but sometimes peeled. Excellent for marmalade, jam, various deserts, biscuits, pies, cakes etc. Figs can also be used in savoury dishes. Although figs can tolerate dry conditions they need plenty of water during the growing season to produce large succulent fruit. Plant your tree in full sun, preferably on warmer North to North-East facing slopes. Trees will need shelter to prevent wind damage to the lush canopy and fruit. The fruit dislikes rain and may split. Figs generally grow in warm, relatively dry climates. Trees may require a small amount of winter chilling (cool temperatures during winter) to ensure good flowering in spring. Figs will not tolerate waterlogged soils for more than a few hours. They should be planted in well-aerated and well-drained soils. 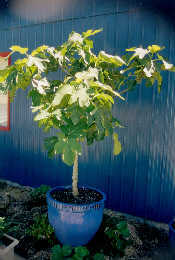 Fig trees are very vigorous and perform extremely well in deep soils. Heavy clay soils are ideal for figs as these do not stimulate too much growth. Adequate water is needed during fruit and foliage development in spring and early summer. Fertiliser applications are usually only necessary for container grown trees or if grown in low nutrient soils like sand. Too much fertiliser can produce lush green growth at the expense of fruit. So only apply sparingly general NPK in spring. Fig trees can grow quite large and will need pruning to prevent shading of fruit, which delays ripening. Limiting the tree size will also ensure that fruit are easy to harvest. If grown in containers keep the plant pruned at manageable size. Botrytis can appear in cool wet winters on unripened figs left on the tree, can creep into the stem and girdle it, killing the tips and eliminating the embryonic figs present. Can possibly b controlled by copper sprays and good orchard hygiene. In warm humid areas rust may be a problem causing defoliation. Control with sulphur dusts, Bordeaux mixture, zineb and maneb. Good orchard hygiene is important. The main factor to make sure you get some fruit is to keep the birds off or have enough plants for you and the birds. To produce high quality fruit, fig trees need to be well maintained and cared for after planting. By nature the root systems are very inquisitive so be conscious of the proximity of plumbing and services if planting them in the ground. Tharfield Nursery has worked with a New Zealand fig enthusiast to select the current range of varieties to cover both fruit types and long fruiting seasons. We have tried to select varieties with both early season fruiting (Jan-Feb) and a later crop as well (April-May). These are approximate seasons only, and each variety may be a little earlier or later depending on the microclimate.